Photo: Evening in Hoi An's old town. Canary yellow houses draped in bougainvillea, rickety wooden shops aglow with red silk lanterns, rippling green fields of rice, baskets laden with silver fish: Hoi An is redolent of a bygone era, or the 17th and 18th centuries, to be exact. The town features a mix of Vietnamese, Chinese, Japanese and European architecture, and its continued cultural pulse is part of the reason why Hoi An was declared a UNESCO World Heritage Site in 1999. It’s also why tourists come here in droves. Tourism is now Hoi An’s bread and butter but the town’s rise began thanks to international trade. With an ideal position in the delta of the lower Thu Bon River bordering the sea, Hoi An was a traffic hub, connecting both domestic markets and international trade routes. In its heyday in the early 17th century, it was one of the busiest commercial ports in Southeast Asia. The Nguyen Lords allowed the Chinese and Japanese to open shops, build streets and keep their customs. In the 17th century there was a Chinese town, a Japanese town and a Dutch trading port. Hoi An was a confluence where East met West, paving the way for the spread of modern languages, Christianity and Buddhism in Vietnam. Today the town has 1,107 timber-frame buildings. Pagodas, assembly halls, clan houses and 200-year-old shophouses line the ancient streets. You’ll see how buildings connect Nguyen Thai Hoc Street (the front of house serving as the shopfront) to the riverbank making for easy transfer of goods from ships. A big part of the visitor experience is simply strolling the laneways, popping into old buildings, cycling along riverbanks and enjoying the ambience of it all. Heritage sights within the historic quarters require a 120,000 dong ticket that gives entrance to any five places. Read about how the ticket works and which sights to hit up in advance. Of course, Hoi An didn’t earn its reputation among the travellers of today as a must-go just for old buildings. There are endless opportunities for fun. The town may have declined as a commercial port in the 19th century, but today it thrives on tailoring– every other shop offers you the opportunity to make custom clothes, be it a copy of a favourite dress or a flashy one-of-a-kind zoot suit. It’s a fun but slippery slope: go into a shop to browse and emerge with a maxed out credit card and a whole new wardrobe including a skin-tight silk Vietnamese ao dai dress (a word of caution: those dresses accentuate every lump and bump). The number of tailor shops is overwhelming and it may surprise you to know that the majority of those “tailor” shops are just storefronts, with the actual sewing outsourced to workshops. You may actually need to get new clothes made in order to deal with your expanding waistline; Hoi An is famous for its food. From mobile carts to upscale restaurants, it is a fabulously cheap food-lovers heaven and there is a list of must-tries: cao lau, mi quang, white rose dumplings, Hoi An wontons, chicken rice and quite possibly the best banh mi in Vietnam. Who knew a sandwich could be so magical. Cooking classes and food tours are plentiful. Part of what makes Hoi An so likeable is the balance it strikes between culture, activity, urban, countryside and beach. Did your ears perk up at the word “beach”? An easy bike ride from town is one very fine beach called An Bang. During the dry season it’s tough to pull yourself away from this pretty stretch of sand and water. Bask on a sunbed, lounge at one of the laidback eateries or dig into some of Hoi An’s best seafood. Beach bums will also love to hear that An Bang boasts excellent affordable accommodation just a hop from the sand. Once a main attraction, Cua Dai Beach now suffers from severe coastal erosion. However, head to the part in between Cua Dai and An Bang for fantastic undeveloped beach with no crowds. Upping the ante is Cham Island, which boasts even more spectacular sand and water. Join a dive trip or do an overnight stay, braving the unruly public supply boat. The options are endless and independent travellers find it hard to leave. There’s picturesque countryside and many islands to be explored by bicycle, motorbike or boat. Snap those rice paddy pics, paddle in a basket boat down riverways lined with water coconut palms. Further afield, do a day trip to the temple ruins of My Son, one of the most significant Cham sites in Vietnam. Get your fill of the big city with a daytrip to Da Nang just 30 kilometres northwest along the coast or a motorbike cruise along the famous Hai Van Pass, now a backpacker rite of passage. At the end of the day, make sure there’s room on your memory card for a sunset boat ride on the river. At night, meanwhile, the town is a visual feast of colourful lanterns and tourists flock to the river to send candlelit paper lanterns down the water. At the risk of being a wet blanket, the river really doesn’t need any more rubbish in it, but if you must buy a lantern, don’t buy it from a child and negotiate the price down to 10,000 dong for one. And if you get a tale from the seller about how they struggle to make a living, do know that they actually make a killing. Yes, Hoi An is a tourist trap and it suffers from its own success. New hotels and homestays continue to spring up, coach buses continually arrive and unleash swarms and at times the selfie-stick wielding crowds can be insufferable. Unlike Luang Prabang, another heritage town often compared to Hoi An, few locals still live within the historic centre. 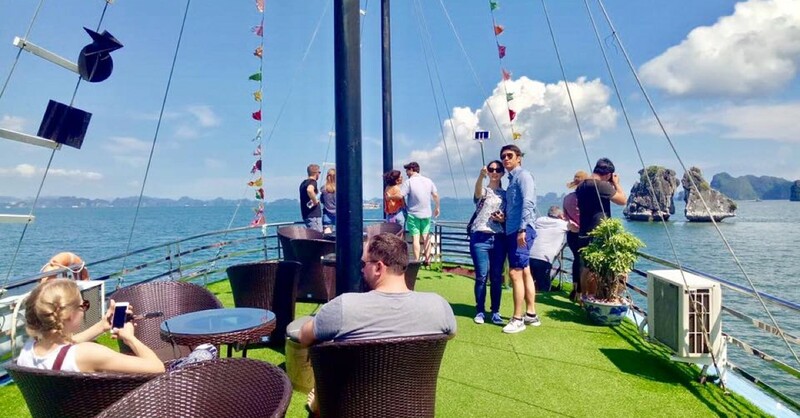 Accommodation is more expensive than other tourist destinations in Vietnam, service can be apathetic and backpackers will struggle to find decent hostels close to the historic quarter. There are three prices to everything: local, Vietnamese tourist and foreign tourist. Bargaining skills are a must -- and beware of scams. Love it or hate it, the old world Hoi An evokes is unlike anything else in a country obsessed with building a new, modern, flashy future.  Please sign up as a Travelfish member to download the Hoi An guide PDF (26.8 MB, 137 pages). Membership costs just A$35 per year (less than A$1 per week) and gives you access to over 250 PDF guides. 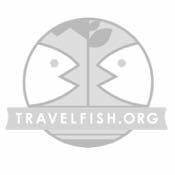 Use the above map to find specific destinations in and around Hoi An which are listed on Travelfish. Bed icons indicate a guesthouse, hostel or hotel, the knife and fork is an eatery or bar and the four-way circular thingy marks sights, attractions and other points of interest. Click on any icon for a short pop-up and a direct link to the page for that spot. If you are in the area, use the teardrop icon near the top left to show your position on the map (you'll need to allow position sharing for this last feature to work).